For six centuries, the ancient Maya flourished, with more than a hundred city-states scattered across what is now southern Mexico and northern Central America. Then, in A.D. 695, the collapse of several cities in present day Guatemala marked the start of the Classic Maya’s slow decline. Prolonged drought is thought to have played a role, but a study published this week in the journal Geophysical Research Letters adds a new twist: The Maya may have made the droughts worse by clearing away forests for cities and crops, making a naturally drying climate drier. “We’re not saying deforestation explains the entire drought, but it does explain a substantial portion of the overall drying that is thought to have occurred,” said the study’s lead author Benjamin Cook, a climate modeler at Columbia University’s Lamont-Doherty Earth Observatory and the NASA Goddard Institute for Space Studies. More than 19 million people were scattered across the Maya empire at its height, between A.D. 250 and A.D. 900. Using population records and other data, the study authors reconstructed the progressive loss of rainforest across their territory as the civilization grew. The researchers ran computer simulations to see how lands newly dominated by crops would have affected climate. In the heavily logged Yucatan peninsula, they found that rainfall would have declined by as much as 15 percent while in other Maya lands, such as southern Mexico, it would have fallen by 5 percent. 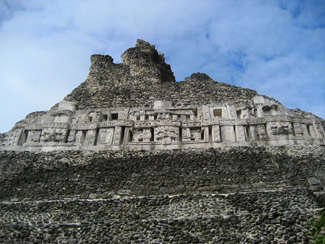 Overall, the researchers attributed 60 percent of the drying estimated at the time of the Maya’s peak to deforestation. As crops like corn replace a forest’s dark canopy, more sunlight bounces back into space, said Cook. With the ground absorbing less energy from the sun, less water evaporates from the surface, releasing less moisture into the air to form rain-making clouds. “You basically slow things down—the ability to form clouds and precipitation,” he said. The idea that the Maya changed the climate by clearing away jungle, partly causing their demise, was popularized by historian Jared Diamond in his 2005 book Collapse. In the first study to test the hypothesis, climate modeler Robert Oglesby and his colleagues ran a computer simulation of what total deforestation of Maya lands would do to climate. Their results, published in 2010 in the Journal of Geophysical Research, showed that wet season rainfall could fall 15 to 30 percent if all Maya lands were completely cleared of trees. Oglesby, who was not involved in the Cook study, said that Cook’s estimate of a 5 to 15 percent reduction in rainfall, though lower than his own, makes sense since Cook’s simulation used a realistic tree-clearing scenario. The Maya rain god, Chaac, is a common motif in Maya architecture. Chaac appears on this frieze at El Castillo. 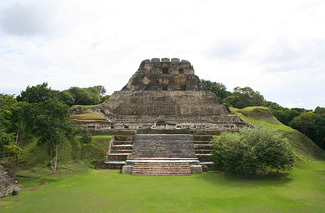 The Maya cleared the forests to grow corn and other crops, but they also needed the trees for cooking large amounts of lime plaster used in constructing their elaborate cities. Thomas Sever, an archeologist at the University of Alabama, Huntsville, and a co-author of the 2010 deforestation study, said that it would have taken 20 trees to produce a single square meter of cityscape. “When you look at these cities and see all the lime and lime plaster, you understand why they needed to cut down the trees to keep their society going,” he said. The Maya also lacked the technology to tap the groundwater several hundred feet beneath them. Their reservoirs and canals were able to store and distribute water when rain plentiful, but when the rain failed, they had nowhere to turn. “By the time of the collapse, every square mile of soil had been turned over,” said Sever. Scientists know from studying climate records held in cave formations and lake sediments that the Maya suffered through a series of droughts yet they continue to debate their severity. In a paper earlier this year in Science, researchers Martín Medina-Elizalde and Eelco Rohling of Mexico’s Yucatan Center for Scientific Research found that annual rainfall may have fallen as little as 25 percent during the Maya’s decline, from about A.D. 800 to A.D. 950. Most of the reduction in rainfall, however, may have occurred during the summer growing season when rain would have been most needed for cultivation and replenishing freshwater storage systems, they added. More: A NOVA episode about the Maya featuring archeologists Bill Saturno and Tom Sever.